This is an Australian Aboriginal painting by Roslyn Ann Kemp. Like many Aboriginal paintings, it is made up of many dots (pointilism). The focus in this painting is very scattered. Initially I found my eyes being drawn to the large circles of yellow and brown colors, but from there the focus goes to the swirling aqua lines. The painting is called Three Rivers Dreaming, which is more than likely what the aqua patterns are. Many Aboriginal works are about the artists dreaming, which is like a path in life, or place in the world. The colors add both warmth and a certain coolness, but due to the shapes and swirly diagonals that the lines take, it appears more warm and inviting rather than cool. Once you follow the "rivers" it leads the eye to more detailed parts of the painting like the smaller circles, and other colors in the background. To me the painting is so interesting and does seem to portray a journey of sorts. I chose this painting because I lived in Australia for five months a few years ago, studying abroad. The history behind the Australian Aboriginal cutlure, as well as their artwork is fascinating. 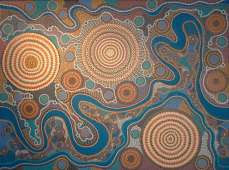 It is because there is so much history there that Aboriginal art is so meaningful. Sadly, also due to the history, Aboriginal art is often stolen, appropriated, or purchased at a rediculously low price from Aboriginal artists simply trying to survive. Great choice, and great discussion. The history of aboriginal painting is fascinating, because aboriginals have been making art for thousands of years, and in the 1970s a white art teacher introduced some aboriginal communities to modern materials and the possibility of selling paintings for profit. The model of aboriginal painting and art is radically different than our conventional ideas about art and artists and is a great reminder that we can't make assumptions about what art does and what art means. I would love to purchase a print of this, any information on if this is available would be appreciated.